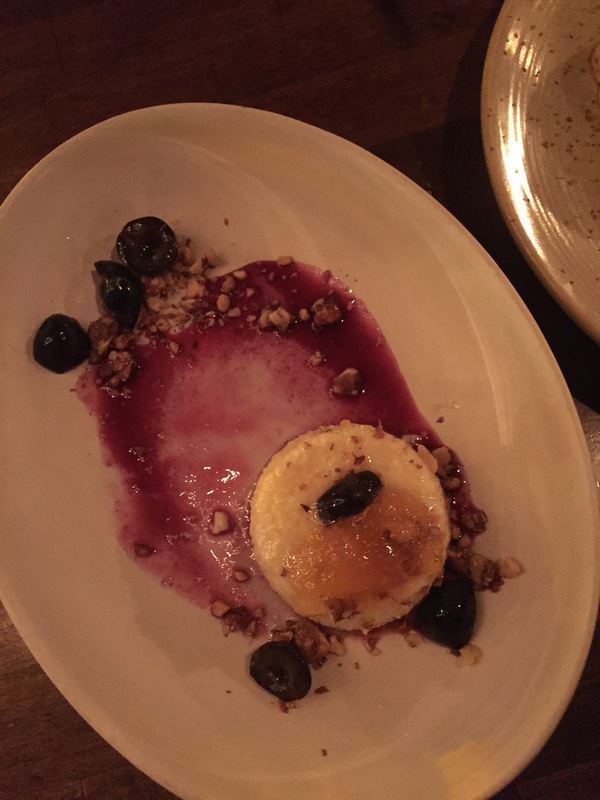 This week, I was invited for a preview meal and chose Whisknladle in Little Italy. The last time I think I dined at Whisknladle, I’m pretty sure none of my friends had kids… so it’s been a while! I was looking forward to my visit, as I always hear amazing things (and I’m a big fan of their Prepkitchen locations). T was occupied for an evening, so I took the opportunity to have some girl time with my BFF. One of the things I do love about Whisknladle is the fact that for San Diego Restaurant Week, you choose dishes off their regular menu. While I appreciate that SDRW offers some chefs an opportunity to showcase something they don’t typically offer, I don’t like not being able to order it again if I really enjoyed it. Now, you may slightly run that risk at Whisknladle since they change their menu slightly all the time, but it’s usually just a dish or two at a time. 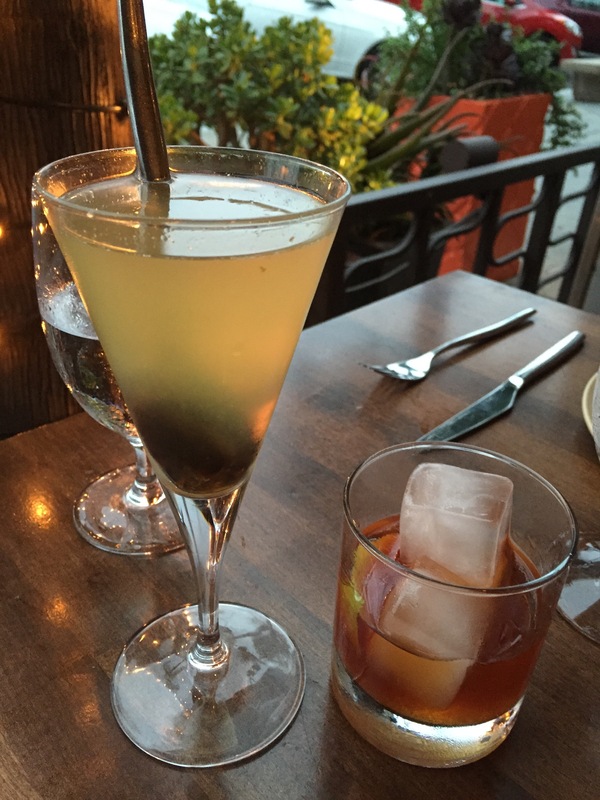 We started with some cocktails and bread – I chose the Mr. Tessier, which is armangac, lime, sparking wine, and a prune; my friend went with a classic Old Fashioned (bourbon, sugar, bitters, and an orange twist). The bread was deliciously soft and pillowy and I had a hard time eating just one slice. I probably should have skipped the bread altogether, knowing how much food was going to be arriving, but I couldn’t help myself. 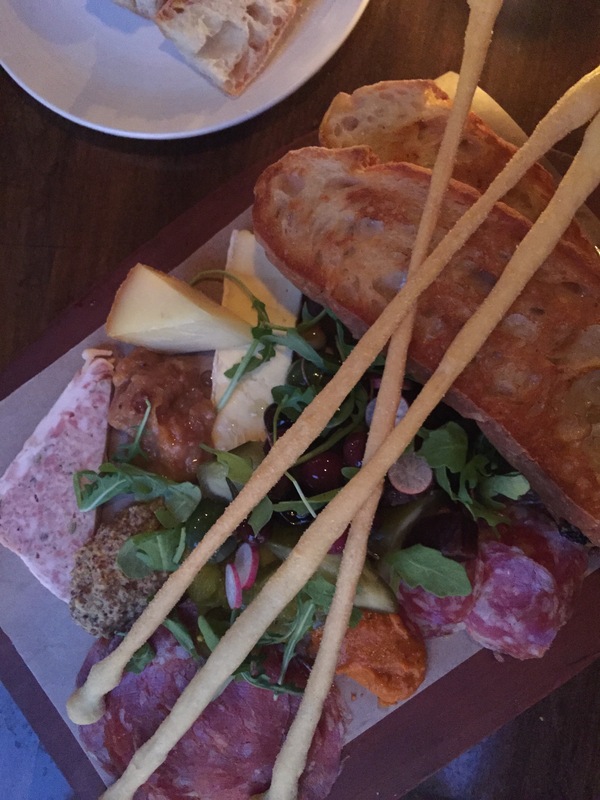 One thing I’ve always heard about Whisknladle is that their meat and cheese board (called the Cutting Board) is amazing. So, we had to order it! And, it is indeed amazing. Not only is it one of the most beautiful boards I’ve ever seen, but it’s full of meats, cheeses, mustard, sauces, pickles, olives, and a smattering of greens. 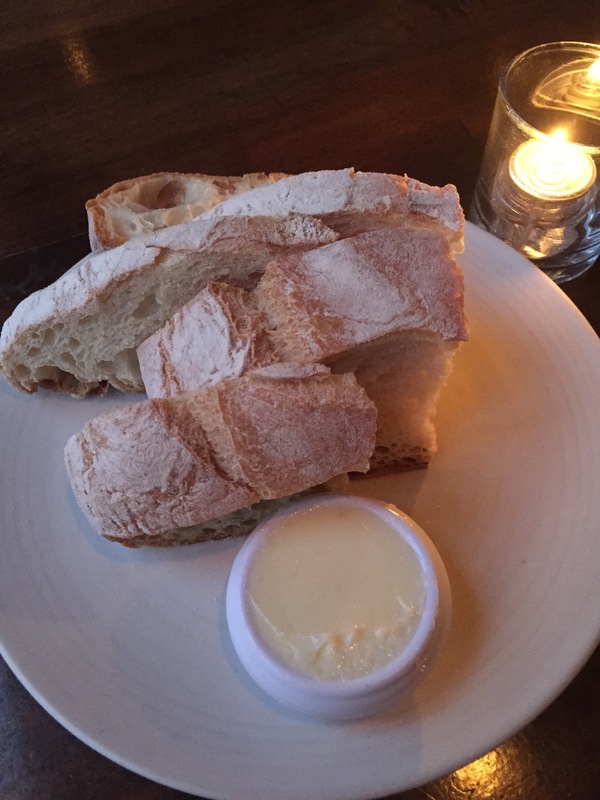 Plus, the buttery toasted bread that comes with it was fantastic. I could make a meal out of the Cutting Board alone… and then I wouldn’t have to share with anyone! I’m going to ask forgiveness for the horribly-terrible photo here, so just don’t look at it for too long. Glance at it, but then pay attention to all my words instead. 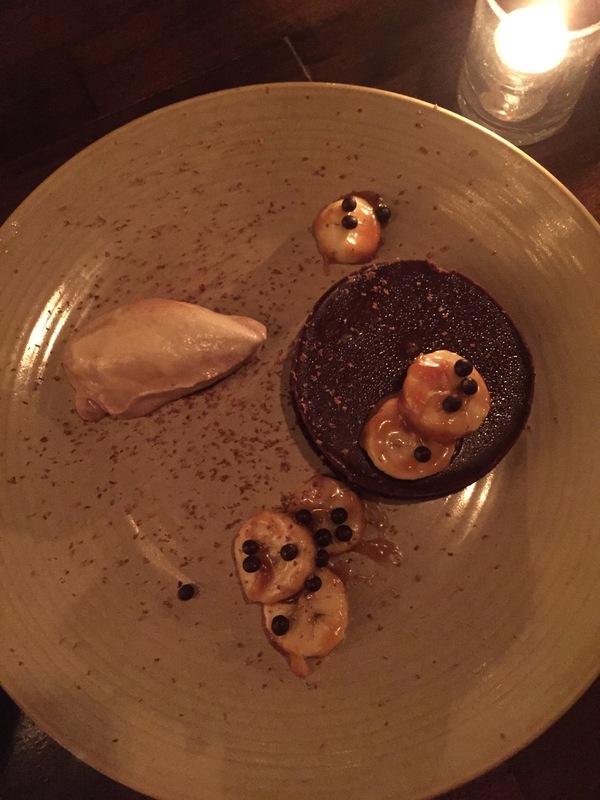 As soon as I saw “Foie Gras Ganache” on the menu, I knew it had to be one of our dishes. Thankfully, my dining companion is easy to order with and also has a taste for fois gras (I’m so sorry little ducks, but your fatty livers are beyond lip-smacking.) The fois gras ganache is served with bacon fat biscuits and strawberry jam, with a sprinkling of chocolate. Our server described it as a grown-up PB&J and it really was. 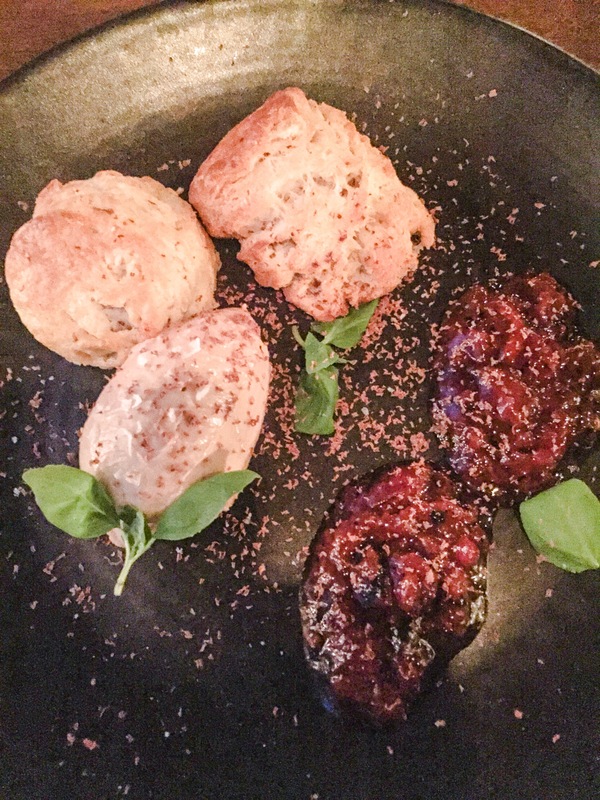 The fois gras ganache was light on the liver-y aspect, but made a perfect bite when piled onto a piece of biscuit and topped with jam. I also could have eaten this all by myself and I would certainly order it again if I saw it on the menu. I should note that this was the only plate we practically licked clean (not because the other dishes were failing, but because we knew we couldn’t leave any of this behind). For our entrees, we chose the fried chicken (which is a seasonal dish, so order it while you can) and the squid ink linguine. 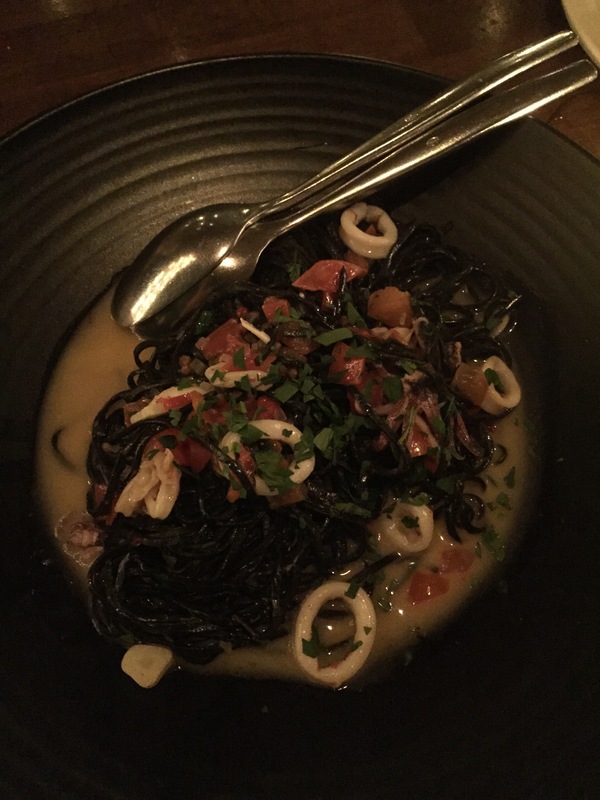 Whisknladle makes their pastas in-house, and their squid ink linguine was perfectly al dente and well balanced with the briny flavor of ink, along with the slices of squid and tomatoes tossed alongside. 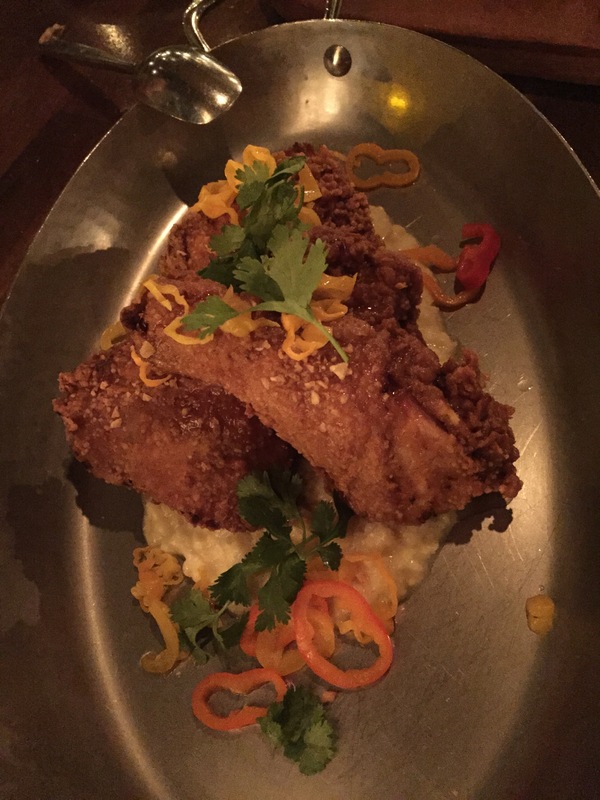 The fried chicken came served on top of creamed corn (which I could eat a bowl of) and even the breast piece was juicy, crispy, and well brined. I’m hoping the drumstick is still in the fridge when I get home because leftover fried chicken is pretty much awesome. And then we had dessert! Of course we had dessert! I always end meals with dessert and I was very much looking forward to these. We decided to try their blue cheese cheesecake and the chocolate truffle torte (I am so happy I didn’t have to eat a molten lava cake… sorry, molten lava cakes). I AM a chocolate lover, so the chocolate truffle torte was right up my alley. With some caramelized bananas and (I think) a peanut butter mousse, I seriously considered finishing the whole thing. But I was also so full… so we took the rest home. These leftover better also still be in my fridge when I get home or there will be hell to pay! It’s definitely a chocolate-truffle dessert – rich and fudgy and dense. It was really good. This meal reminded me why everyone loves Whisknladle and I hope I don’t take so long for another visit! It was truly a delicious meal, with amazing service, and the best company. If you’re still waffling on where to go for Restaurant Week, I would absolutely recommend you get a reservation at Whisknladle!! Disclosure: I was invited to preview the San Diego Restaurant Week menu and our meal was complimentary; however, I was not compensated for this post. As always, all opinions are my own. This entry was posted in food, restaurants and tagged food bloggers, la jolla, san diego, san diego restaurant week, sdrw, whisknladle. Bookmark the permalink.